North American area codes 367, 418 and 581 are overlaid telephone area codes serving the Canadian province of Quebec, encompassing the eastern portion of the province. 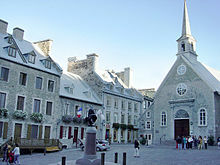 Communities served by the 367, 418 and 581 area codes include Quebec City, Saguenay–Lac-Saint-Jean, Rivière-du-Loup, Rimouski and the Gaspé Peninsula, Côte-Nord and southeastern Mauricie regions. 418 also serves the tiny hamlet of Estcourt Station, in the U.S. state of Maine. The main area code, 418, was one of the original area codes created in 1947. Then, as now, its boundaries were depicted as generally the eastern half of Quebec. Nominally, northwestern Quebec—one of the few areas of North America without telephone service—was shifted to 418 from 514 in 1957. From the 1950s to the 1970s, 418 was also nominally the area code for the eastern Northwest Territories. However, in the 1970s, as direct distance dialling was introduced to the far northern and western portions of 418, these points were shifted to area code 819, leaving the present area. In 2008, area code 581 was implemented as an overlay after 418 came close to exhaustion. In 2018, Area code 367 was implemented as 418 and 581 were close to exhaustion. The incumbent local exchange carriers in 418/581 are Bell Canada, Bell Aliant, Telus (formerly Quebec-Telephone) and Vidéotron, plus some independent companies. ^ "Area Code 418/581 Relief Plan". Archived from the original on 2017-12-12. This page was last edited on 9 December 2018, at 00:55 (UTC).